Standing in front of the studio audience while three cameras live-stream to YouTube, Charlie Todd offers a brief tutorial on improv comedy then issues a challenge to the countless viewers and Twitter users at home (literally, as no one knows just how many are there). He wants them to tweet jokes based on the topic #mygooglehistory. Pulling from the tweeted responses, he reads one: “How to make my mom tell me she loves me,” he says. The studio audience bubbles with a few random chuckles. “Maybe they’re being a bit too real here,” Todd says. Mind you, being arbiters of what’s good is not the same as creating it. It’s why you never see Simon Cowell take the stage and belt out a tune and Roger Ebert’s lone screenwriting credit has a 5.8 out of 10 rating on IMDB. In short, no, not everyone can do this. Not everyone’s a comedian. But if anyone can find gold in the vast rivers of mud, it’s Todd. With close-cropped hair, bright blue eyes, a perfectly manicured beard and grandma-polite demeanor, Todd is a breath of sanity from the classic mentally fragile psyche of a comedian. But you got to watch out for the quiet ones. 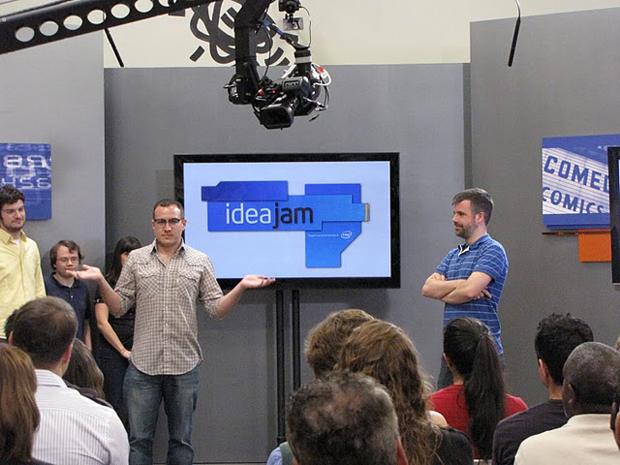 So Todd was tapped as host/teacher/moderator for the third installment of IdeaJam, a collaboration between Katalyst and microprocessing giant Intel. It’s an interactive, experimental brainstorming effort in which a pro moderator leads experts and hand-picked participants in exercises and discussions. Then he opens the whole thing up to let members of the public at large interact with the big guns, via various forms of technology and social media. The goal is to get to the concrete center of the abstract concept of inspiration and collaboration–comedy, in this installment. As it emerges as the dominant force of online video and giants like YouTube try to bottle it for profit, IdeaJam wants to find out whether seemingly spontaneous (and viral) humor can be engineered. “It’s a lot like opening your fridge and pulling out a bunch of ingredients,” Intel rep Laurie Koehler said before this latest Jam got underway. “You’re not quite sure what you’re going to make, but at the end of the day you have a great meal.” Or Spam and eggs covered in ketchup. On a philosophical level, IdeaJam is meant to solve today’s tech riddles. In this chapter, it seeks answer to questions like: Can you recreate the live show’s audience-performer feedback loop through a bunch of loners in front of their computers? If Twitter is the world’s largest writers room, how do you filter out the many duds and find the gold? Is a viral video popular only because someone else said it is? And does it need to include cats? The Jams are first live-streamed to allow home viewers a chance to chime in; then tapes are edited and uploaded later to the project’s YouTube channel. If you missed the former last weekend, tune in at the end of July for the latter. But the live action is really where the magic happens. If it happens. “Where DVR almost killed it, Twitter is making live television relevant again,” Todd says. Theoretically, then, this immediate exchange should be a perfect fit for comedy. A traditional improv show works, because it’s being created live, and you know it’s being created live (read a transcription of any improv performance the next day and try to find what you thought was so funny at the time). And a comedy club is basically an American Idol-style instant voting system–a laugh is direct approval of the joke the comedian can weigh to decide whether or not to keep it. The negative end of that live exchange is even in attendance here today: Hecklers are lurking. “We haven’t had to deal with this kind of reaction before,” says online comments moderator Rita Sweeney from her perch in the back room. The Twitter feed is relatively clean but, as anyone who’s slogged through the digital swamp of comments below a YouTube clip could imagine, the commenters there need constant babysitting. “We want to keep it PG-13,” Sweeney says as she expunges one commenter’s wish to punch a performer in the face. But ultimately it’s part of the live test. But this IdeaJam takes things further than improv actors and YouTube and Twitter feeds. The Comedy Box segment asks everyday folk to jump into the experiment. While the IdeaJam was going on, a phonebooth-style kiosk with a monitor and Skype hook-up sat in the tangle of tourist bait in the heart of Universal Citywalk in Burbank. Folks from the street were herded into the Box to perform a scene with improvisers at the Katalyst studios. These, as you’d imagine, did not go well. Instead of giving the Boxers some direction as to what they were doing, they were just thrown in and told to watch a video. Improvisers began a scene while the Boxer just gawked at the video, until an improviser mentioned the person’s appearance, giving them the cue that this was all being broadcast live. A slight smile and quick Q&A closed out the “performance.” “This what the new YouTube is going to be like?” asked one confused participant before quickly retreating. At the beginning of the event, three performers filmed a purposefully serious scene–a funeral home manager helping two mourners pick out a casket–with the hope that, throughout the day, suggestions from live-stream commenters and Comedy Box participants would help punch it up. “Add more jokes,” offered one Comedy Box viewer, in what turned out to be the only helpful piece of writing advice of the day. The unfunny scene was also used a bit more successfully in the “Power of Suggestion” experiment. Improvisers exited the Comedy Box laughing hysterically, telling the next in line that it was the funniest video they’ve ever seen. Regular people would then walk in and watch the funeral home scene, the purpose being to see if someone would laugh merely because someone else said it was funny. After three hilarious deadpan stares at the video, the answer was decidedly no, they wouldn’t. “So, um, let’s use the lessons we learned today and make that scene funny,” Todd said half-heartedly, being given these directions from an earpiece connected to the control room. The performers gave the funeral scene another go, trying to reestablish the same beats from the original. But this time, you know, funny. After a few minutes of wheel-spinning, Todd gave the trio a grateful Mercy Edit. “That wasn’t funny enough, was it?” asked a performer. After a brief closed-door session with the director, Todd came back and told the improvisers to throw out the funeral home setting and just do a new scene from an audience suggestion. “Santa Claus” was quickly shouted and the skilled professional improvisers sent us home after a few hearty chuckles. In the end, the answer to the question of how you make something funny is the same as it ever was: It is when it is. And if it isn’t, add a fat guy.